CHARLOTTE, NC - MAY 18: Johnny Sauter, driver of the #21 ISM Connect Chevrolet, celebrates with the checkered flag after winning the NASCAR Camping World Truck Series North Carolina Education Lottery 200 at Charlotte Motor Speedway on May 18, 2018 in Charlotte, North Carolina. Photo by Sarah Crabill/Getty Images. The NASCAR Camping World Truck Series returned home to Charlotte Motor Speedway this past Friday night for the seventh race of the 2018 season. Familiar drivers shined while others didn’t. Here’s a look at this weeks four takeaways from the North Carolina Education Lottery 200. Johnny Sauter Dominant Once More – It seems that Johnny Sauter is becoming the Kevin Harvick of the Truck Series. After he was awarded the pole Friday due to thunderstorms canceling qualifying mid-afternoon, Sauter dominated most of the race by leading five times for 71 laps, earning five Playoff points. It was his third win of the 2018 season and the 20th of his career. 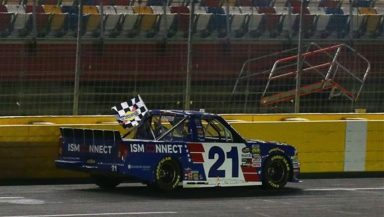 But ultimately, it was Sauter’s first ever win at Charlotte. As the season rolls along, it’ll be interesting to see how many more wins the 2016 champion racks up before the Playoffs. Kyle Busch Has To Wait One More Race – Another race, another wait for the Las Vegas, Nevada driver who is looking to tie Ron Hornaday’s all-time winning record with 51 wins in the Truck Series. Busch had to battle slow pit stops and two pit road penalties Friday night for his crew being over the wall too soon. The last restart certainly didn’t help his chances either, as teammate Noah Gragson spun his tires and backed everyone up. Busch worked his way back up to second but fell 1.34 seconds to race winner Johnny Sauter. Inside Line Had Trouble Restarting – If it wasn’t for Busch or Sauter being the story of the night, it would have been the inside line not being able to get going on the restarts. It seemed as though after a restart, the second place driver would have trouble going on the restart. Some drivers even took to Twitter to describe how tough it was not to spin out, which ultimately gave the high line an advantage. Justin Haley Has Save Of The Season – Is it too early to give awards out for a save of the season? If not, then give it to the GMS Racing No. 24 driver who made an excellent save of the night late in the going and just barely kept it off the wall. It is certainly newsworthy or at least worth a mention. It was pretty cool to see, to say the least. Next Up: The truckers have two and a half weeks off before heading to the Lone-Star state Friday night June 8.